I was scrolling through Twitter quite a while back when I came across somebody asking a question about eye creams. It said something along the lines of "Looking for an eye cream that doesn't cost a fortune, any recommendations?". At the time, I didn't really think about it much, but recently it popped back into my head. It made me start to think about whether I did actually know an eye cream that I've truly enjoyed that hasn't cost so much, and it also got me inspired to indirectly answer this tweet. I sadly never made a note of who wrote it and finding it now would be no simple task, but I'm certain that others are asking the same question. So that brings me to today's post. The Dr. Organic Royal Jelly Eye Serum is a natural, light and gentle cream for the eye area that promises to help reduce the appearance of fine lines, puffiness and dark circles and also boost collagen stability, firm the eye area and provide long-lasting moisture. It contains fresh royal jelly, pure honey, a blend of essential oils, aloe vera, vitamins B5, C and F and even green tea extract. It is free of parabens, artificial colours, harsh chemicals, fragrances or preservatives and SLS, is suitable for vegetarians and is not tested on animals. It comes packaged in a bright orange squeezy tube with a screw cap lid that has a pointed opening to dispense the product. The Eye Serum itself is white in colour and is a silky smooth consistency. Bringing it back to the opening of this post, this eye cream is also fairly inexpensive, costing £9.99 for 15ml. But does it do what it claims? Let's take a look. Apply a small amount to the eye area using your fingers, starting from the outside corner of your eyes and moving in towards your nose. Use twice a day. 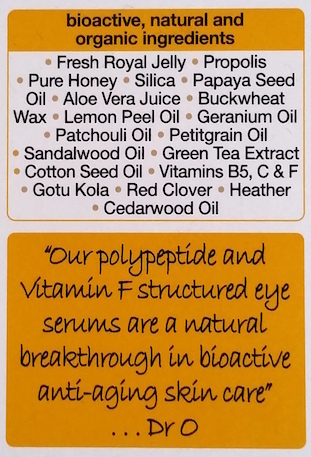 With the Dr. Organic Royal Jelly Eye Serum, there are instant results and results that come with continued use. When you first use the product, the eye area feels immediately firmer, smooth and less puffy. It is also slightly cooling which is always a nice feeling. After a short while of using, you start to notice the fine lines start to fade slightly and dark circles begin to reduce. My main concern is dark circles and overall tired looking eyes and I find that this Eye Serum addresses them well, so if these are issues of yours as well then you will likely find relief here. I don't have a huge issue with lines under my eyes, but there are a couple of rather fine lines (oh man, I suddenly feel old). This Eye Serum does help somewhat, but I personally think that it is better with the dark circles and puffiness. That's not to say that it does nothing, but just don't expect it to make them vanish completely (and that goes for all eye products, really!). There have been instances in the past with a couple of eye products that I have used where I have experienced some kind of irritation which usually results in watery eyes. I have had no such issue with this particular serum though, so if that is a concern of yours then you should be fine with this. Overall, I think that this is a really decent eye cream at a great price. It does what it claims, addressing dark circles particularly well and reducing the overall look and feel of tired eyes. It's perfect for those of us who maybe don't get enough sleep too as it feels nice and refreshing first thing in the morning. It also sits well underneath makeup. 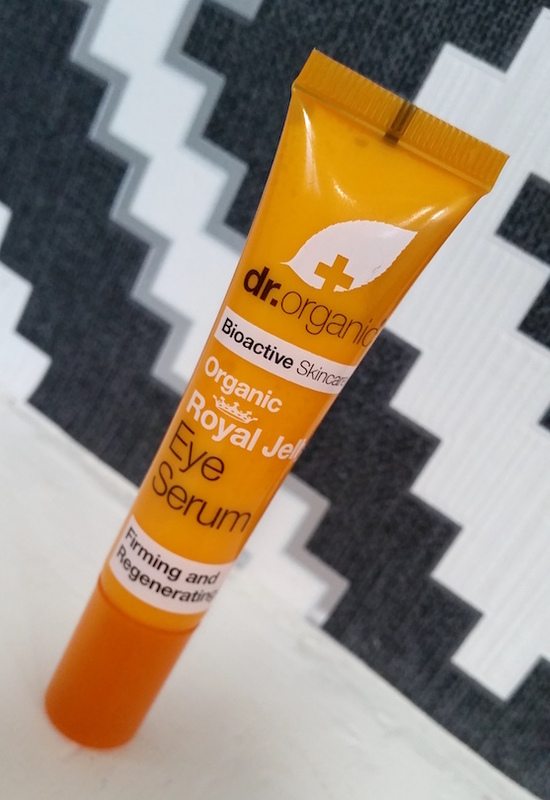 If royal jelly isn't quite your thing, Dr. Organic also have Eye Serums that are part of their other collections available, such as Rose Otto and the Holland & Barrett exclusive Snail Gel range! 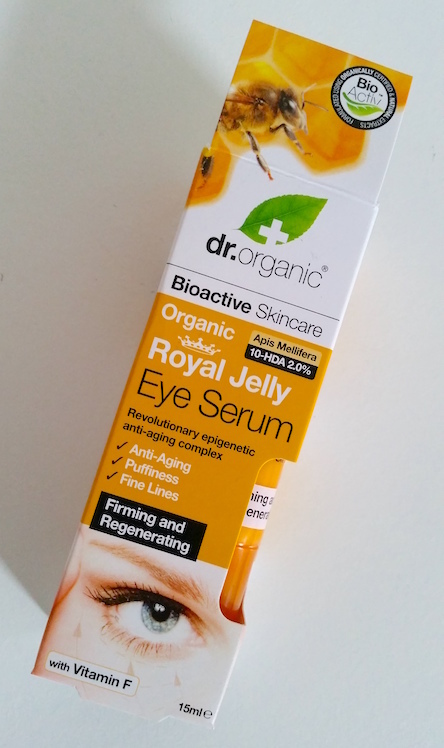 You can purchase the Dr. Organic Royal Jelly Eye Serum for £9.99 from Holland & Barrett. 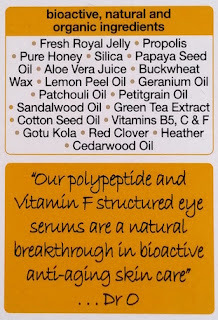 What are your thoughts on the Dr. Organic Royal Jelly Eye Serum? Do you have a favourite, inexpensive eye cream?